The CTBUH team discusses Conference plans with the Middle East Steering Committee. DUBAI – Traveling to Dubai in preparation for the 2018 Middle East Conference, CTBUH Executive Director Antony Wood and Events Manager Jessica Rinkel-Miller had a full itinerary of meetings, presentations, and site visits to both promote and formulate the proposals for the event taking place in Dubai and Jeddah from October 20 – 25. The week kicked off with the Conference Steering Committee meeting at the JW Marriott Marquis Dubai, the main venue for the Dubai portion of the conference. 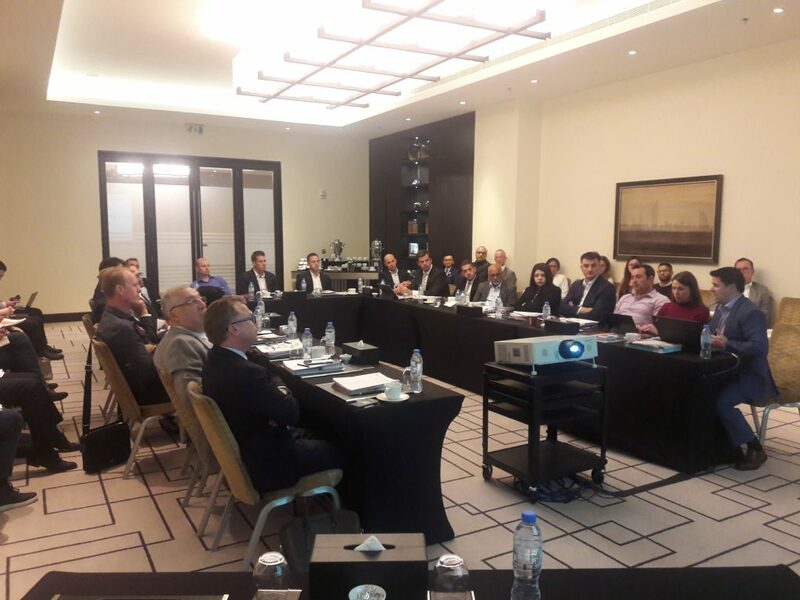 There were 35 representatives from Middle East-based firms in attendance to further advance the thinking around the conference topic of Polycentric Cities: The Future of Vertical Urbanism. The committee shared ideas for hosting successful networking receptions and considered relevant themes that would be the focus of conference sessions, symposia, and off-site programs. Following the meeting was a venue tour of the JW Marriott with the steering committee to formulate how the conference could best use the available spaces to its greatest advantage. The JW Marriott, the world’s tallest all-hotel tower complex, boasts stunning views over Downtown Dubai and the Dubai Water Canal while providing exceptional amenities and 5-star accommodations. 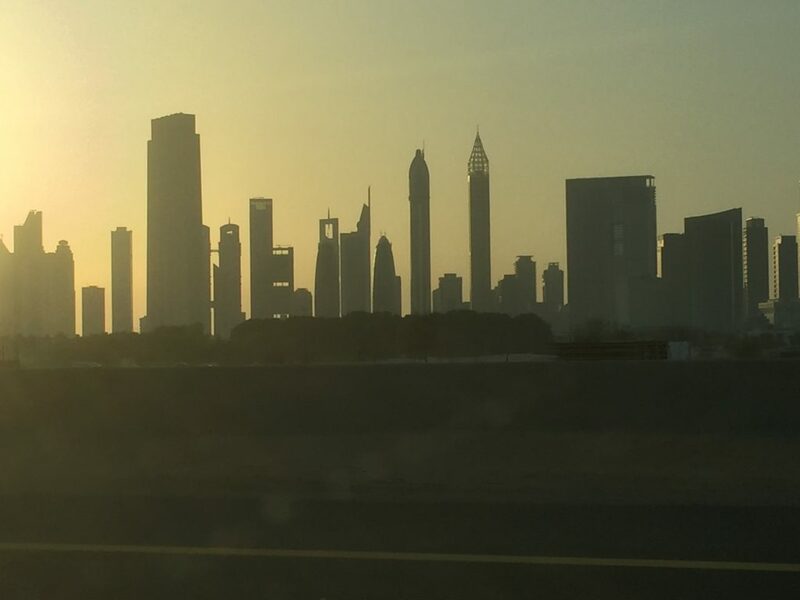 The sun rises in Dubai as the CTBUH team prepares for busy week of conference preparations. The visit to Dubai also provided an opportunity to meet with several leading Middle Eastern companies to discuss their involvement in the conference. The Council is hoping to gain support from key Middle East-based owner/developers to showcase the region’s top urban developments, either through presentations at the conference or off-site programming at the projects themselves. The CTBUH team was treated to a desert safari outside Dubai, hosted by local logistics partner CSI. Starting on Monday, January 22, Antony and Jessica visited a number of locations for potential off-site programs, and met with representatives from some of the most notable developers in the region. These companies included Emaar Properties; Gemstone Development; Meydan Group; Jumeirah Group; Brookfield; Meraas Development; Mashreq; Omniyat Group; NSHAMA; Emirates REIT; Dubai Land Department; ALEC; Arcadis; Koltay Façades; Foster & Partners; Dar Group; and Emirates Green Building Council. In addition to the many meetings and discussions surrounding the Dubai portion of the conference, Antony was also able to virtually meet with representatives of Jeddah Economic Company, Diamond sponsors of the Conference, to discuss the Jeddah Program that will take place during the final two days of the event. This included preliminary planning for a tour of the world’s next tallest building, Jeddah Tower. The week closed with a trip to the Dubai Desert Conservation Reserve outside the city, hosted by local logistics partner CSI. 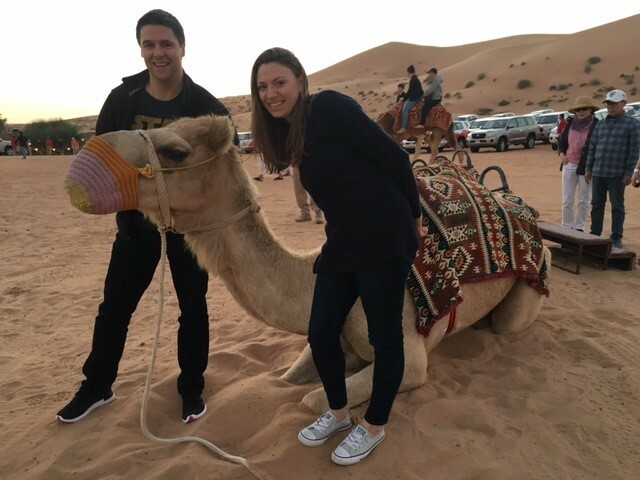 Antony and Jessica were able to experience a desert safari trip, where they enjoyed sand boarding and a camel ride before being treated to a delicious Arabic-style dinner at a traditional Bedouin camp. The trip to Dubai was instrumental in engaging regional partners for the event, and went a long way in ensuring the success of the Middle East conference.